As we travel we write about the experiences, the quirky sides, the profound moments and all manner of thoughts and lessons in between – Enjoy! “Dear sister till now, I and church members distributed Capturing God’s Heart studies,1456 to church Reverends and Presidents, c.s.i.Deans, Chairmen, Evangelists, Roman Catholic Catechist’s Pastor’s and many people. They are reading and understanding the love of God and many local and non-local persons and non-local churches Director’s are asking me to distribute the God’s Heart studies. We simply give God the glory for the impact of the Holy Spirit via these simple Capturing God’s Heart studies. Heartily Greetings to you in Jesus precious Name! Thank you for CCI School of Discipleship – Part ONE. I am Studying and understanding every sentence, very useful to our ministry. I and our ten pastors we all are studying and praying every day. 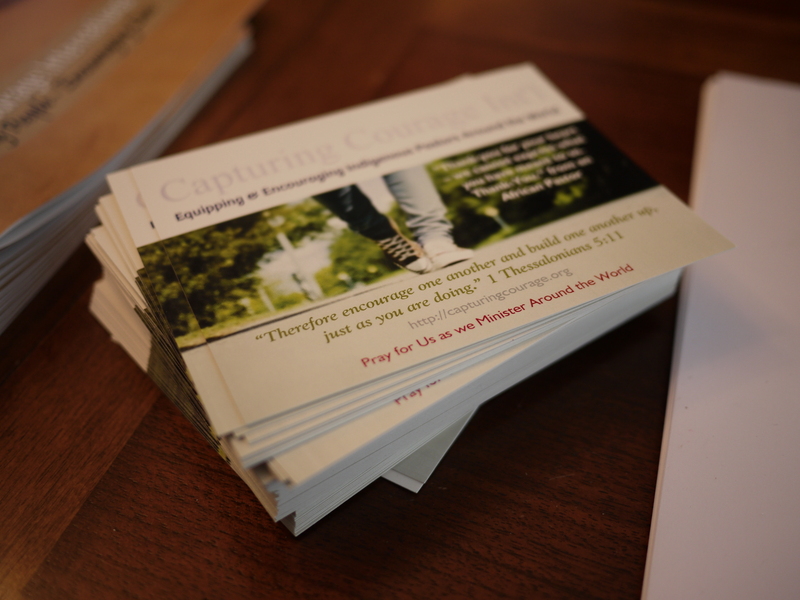 As the Walking in Spiritual Authority material begins to make its way around the world we simply pray that students are personally touched by the power of our Living God. Please pray for these eleven lead pastors in India, for both provision and for clarity about how to take this course to other pastors and to congregations. They are hungry for training and discipleship material. Timothy writes weekly asking for further materials as he has been one of the primary distributors of Capturing God’s Heart, having already passed them on to 1000 pastors. We are just trying to keep up with him! We declare the Lord’s blessing and peace over him this day. “Much greetings and much blessings to you in Jesus most precious name. Thank you for your mail and inquiry and what we are doing here, especially with the Capturing God’s Heart studies. I am so much blessed because of God’s grace and love that enabled me to be connected to you so that I may have access to your teachings. I am a church planter in the rural villages and the slums in Kenya. I reach many areas of my nation working with different churches in the rural villages. However our major problem had been lack of discipleship material. Having gone through your material I was very much happy since they are addressing all areas of Ministry. This is when I began using them in my church. I then introduced them to the Pastors working in my Ministry. Since the beginning of this year we adopted Capturing God’s Heart studies as discipleship training material and our teams like them so much. 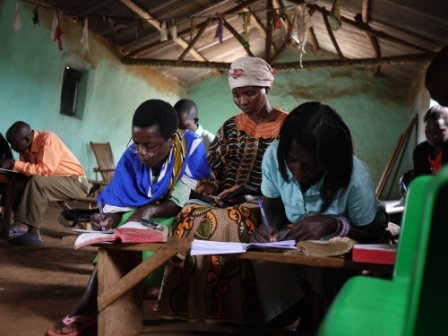 Presently over 4000 people are being taught or benefiting from Capturing God’s Heart every week in the rural villages. Over 60 churches from different denominations in western Kenya, Nyanza, Rift valley, Central and Nairobi are using Capturing Gods Heart studies. Due to poor internet availability in most places I do print and send the printed copies to the villages. I pray God will give you the opportunity during your African trips to visit us and many others. Pastor Michael is just one of six leaders (and many, many congregations) in Kenya who have invited us to fellowship with them – we are waiting on the Lord`s timing and leading regarding our time to come in Kenya. Personally, I am eager to go there. Please keep us in your prayers as we stretch forward into full-on ministry around the world. We thank the Lord for his favor over these God`s Heart studies, and simply commit all our effort and lives to the glory of God and God alone. 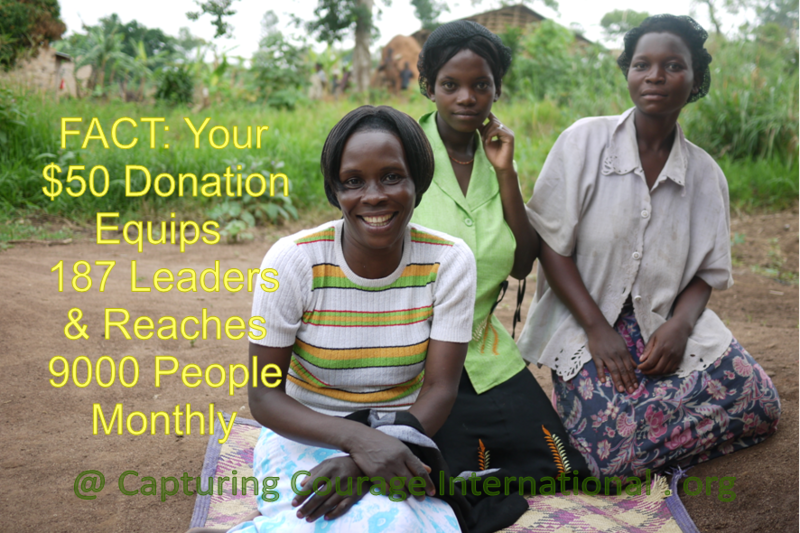 To Donate to God`s Heart around the world, as well as our presence on the ground in Kenya and other nations, go HERE. Note that all donations (within Canada) will receive a charitable receipt for tax purposes. Some years ago there was a prophecy spoken over Capturing Courage International that the Holy Spirit was going to go out from CCI all around the world; like colorful ribbons of joy and healing and comfort extending from our home base to many in many other places all over the globe. We made note of this prophecy, and yet wondered at the vastness of the content, ‘How might this be?’ we asked. As you may know we have been making available a small Bible study called Capturing God’s Heart on a monthly basis to indigenous pastors around the world. And we thought it was time to take a survey and to see how many people are being impacted so far. “I am going to many public crusades and pastors conferences and more churches for preach the word of god to the pastors and Christian leaders and many people as a main speaker in Andhra Pradesh in India. Already we distributed Capturing God’s Heart studies to a minimum of 1000 church pastors and evangelists Christian leaders and bishops. 100’s of people they are reading and understanding and they are asking me for some more Capturing God’s Heart studies for distribution to many people; it is very needful to every church and everyone. Pastor Timothy finishes off his email by requesting more God’s Heart Studies so that he can distribute them further. One of the things we have learned at Capturing Courage is that when we show up and do our part, God shows up and does the rest. It is the pleasure of our Lord to take our simple offerings and make them into something that could have never been on our own. While we have been regularly communicating with Pastor Timothy we had no idea that he was distributing Capturing God’s Heart to this extent. We know, that for every leader that receives one volume of God’s Heart that they in turn pass it on to anywhere from 10 – 500 other people themselves. I’m not sure we are really going to be able to add up these numbers once they all start coming in. We simply claim this work for the glory of God and God alone and in the name of our Lord Jesus Christ. I am pleased to let you know that we’ve formatted all the Capturing God’s Hearts into packages of 10 Volumes each. Realizing that there have been those going through all the individual links to print off each one, we’ve now streamlined that process for you. 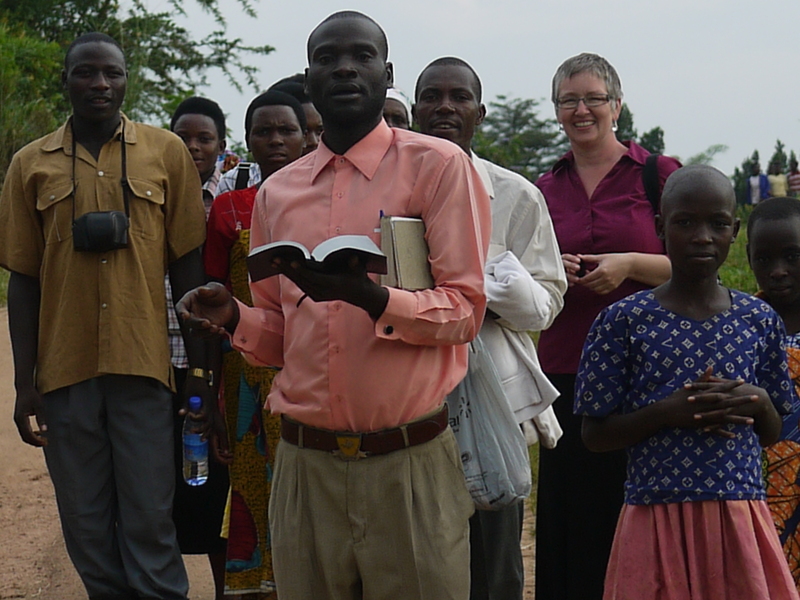 Our Walking in Spiritual Authority course went well in Madudu, Uganda. We are thanking the Lord for his presence amidst it all. Re-crafting the material for an overseas audience has been most interesting. Most of the metaphors used here for our own culture have been completely off the mark for third world countries. For instance, one of the pictures we paint (imagine with me) here in Canada is that of a small frog on a lily pad. The frog looks content enough but zoomed in we cannot see much of the frog’s context. So we zoom our lens out and get and see a bit more about the frog’s surroundings. We see that there is a lot of other lily pads, and much more activity going on around the frog than our first picture. If we zoom out again we see that frog’s world is in fact very large. So large in fact that frog may not have even explored to the edges of this world. There is much for frog to do, much to see. And then we zoom out one last time, and lo and behold frog lives in a beautiful garden of luxuriant foliage, beautiful water features and unexplored paths. It is stunning and so much more than frog can most likely even imagine. I tell this story to bring to life that here in North America we have made our worlds very small, when in fact the world is very big. We stay within our nice little lives when in fact there is a much bigger world waiting for us, that is not scary, but rather beautiful and vibrant – if we will just trust God to take us beyond our safety zone. Well writing this story for our overseas colleagues doesn’t work. I tried. I have a nice little picture of a lizard on a rock from one of my trips, and so I thought I could write the same progression from focussed in life to big picture living. But it doesn’t work, and isn’t even culturally relevant. For starters, we zoom out from the African lizard on the rock and we do not get nicer, we get more barren. Consider zooming out and out and out in Kenya’s dry grasslands and the picture does not gain in complexity but actually increases in dry and dusty. The metaphor doesn’t work. In the rewriting of the material I realized that not only does the picture not work, but that the people themselves need something completely different. The Pastors and Evangelists that I have met have a very good idea of the world as a big place. And they are forging forward into the very big world quite successfully. There is a resilience to go out of the their comfort zone that seems quite normal in Africa. So I switched the metaphor. I began with a zoomed out view of many, many people, and then began focusing in. Bit by bit, taking in country, and towns and villages, and then finally family down to one person. While in North America we need God to prick our consciences about the bigger world, in Africa they need to know that God loves them intimately and personally. The lesson is, God loves you. God forgives you. God knows you and has called you to himself. This is just one example of the many changes I’ve had to make to the Walking in Spiritual Authority course – but changes we are glad to make in service to our overseas colleagues. We invite you to support this work with a monthly $30 subscription. Every little bit goes a long way. We keep in mind today those on the front-lines of the gospel of Jesus Christ around the world. Pastor Edward whose wife just had surgery – pray for health and healing and the funds to pay for the operation. Pastor Michael as he heads up ministry to disabled children – pray for funding and direction, clarity, peace and great joy for all. Evangelist Nicholas who has a team ready for evangelism – pray for a way to coordinate their heart and efforts with a van and sound equipment. Pastor Daniel whose heart is for all the surrounding villages to know Christ – pray for relationships that bear fruit. Evangelist Patrick who is investing in the lives of children in a remote village with a school and now an orphanage – pray for solid encouragement and provision over all the work of his hands. Pastor Ravindra who is investing in the lives of orphans – pray for provision as well as others who will invest in the work. Pastor Timothy who travels to outlying villages weekly, bringing the gospel and helping the people with letter writing and other tangible helps – pray for continued strength for himself and his family and for breakthrough in the hearts of the people. 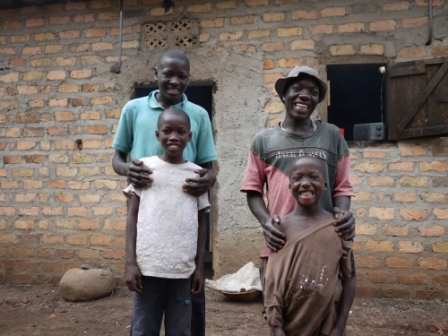 Pastor Philip who is with his family trekking into the back villages bringing the love of God – pray that they are protected from malaria and that the good news settles into peoples hearts. Pastor Michael who oversees many churches and holds the task of training and development – pray that the good things happening there continue and multiply. Pastor Daniel who ministers to congregations thirsty for the word of God – pray that Bibles get to him and the people there, that he and fellow pastors would be encouraged today. School director Geoffrey who selflessly serves over 200 children with education and food daily – pray for funding and for sponsors and for wisdom as they carry on. Pastor Elizabeth and her husband John as their hearts pour into their community, supporting orphans and establishing a school in an area still struggling with Aids – pray for their hearts and the work of their hands, that continual steady progress and forward movement is attained. Evangelist Caliph who pours his life out for his people – pray for continued strengthening and vision for he and his wife. Pastor Irene as she declares freedoms over her own congregation and the many who seek out the Lord through her – pray for her church building to be finished and for the plans for an orphanage and school to take hold and come into being. Evangelist Innocent as he travels and shares the gospel – pray for the anointing on him to increase and for many to come to Jesus Christ. Pastor Steven and his wife as they lead both a church and a school – pray that their influence would grow and that the mentor-ship that they provide would bless many. Lay-leader Joshua as he grows and develops both people and the gospel through business – pray the Lord’s blessing over him and continued expansion of the Lord through his heart and service. Pastor Charagh as he ministers in hard circumstances – pray for the church to grow and prosper and to be covered by the blood of Christ, hidden in him. These leaders (and more that I have not listed here) are literally giving their lives away for the gospel of Jesus Christ, in service to hearts and lives around them. They come from Uganda, India, Mozambique, Myanmar, Kenya, Pakistan, Burundi, Rwanda, Ghana, and Tanzania. Choose one today, to hold before the Lord on a continual basis in prayer and fasting. It has been a year since I’ve been to the eastern parts of Uganda, and I am missing it and the people dearly. Men and women who if we lived in the same neighborhood I’d have been having tea with them on a regular basis. How could a year have gone by just like that?! Moment after moment is replaying through my mind. I am particularly fond of the time Edith scolded me for smelling so bad and in exasperation instructed me in how to wash. (I’m sure she now thinks westerners don’t know how to wash). It is true that when I was there I stunk like a pig twenty-four-seven. 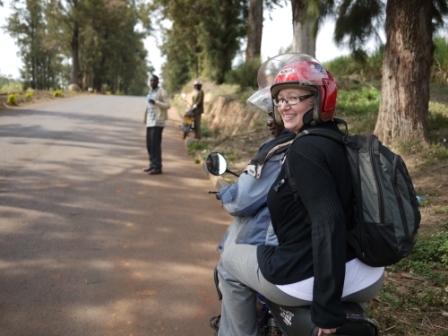 I’m missing the boda-boda rides. Henry was a fantastic driver and I came to trust him explicitly. I learned how to sit tight, lean in, relax, and leave the driving up to him. When on the freeway with a semi-truck passing close enough for me to reach out and touch it, I became a master at sitting tight, leaning in, relaxing, and leaving the driving up to him. Never flinching, not reacting, moving in sync, allowing my body to lean in tandem with his around the curves and through the round-abouts as if I’d done this every day of my life. The day we went through the sugar-cane fields and he let loose on the speed was the best. And as much as I tried the next day, I couldn’t get him to go that fast again (the big boss was with us that time). When Henry took me to meet his ‘moms’, without a seconds hesitation and the minute I got close enough each one threw themselves on me with arms wrapped tight around. Greetings that still warm my heart a year later. And every week I think of Pastor Irene. With her passion and zest and fire, coupled with wisdom and prophetic care and gladness. So that’s what I did. I bent down at the waters edge and swished my hand for a half minute. Walking back to the village Pastor Irene said to me, “Thanks for blessing Jordan.” To which I broke out in a laugh. For while I was hoping to draw blessing from Jordan from her perspective I was blessing it. It was this kind of give and take, blessing and being blessed that was so rich in Uganda. Thankfully we are experiencing this same kind of blessing in our team at Capturing Courage International. Where initiative and offering of selves to something bigger than all of us has us rich in bounty of each other. And even though I’m not ‘out there’ at the moment, it’s just the same in all the weekly correspondence with our colleagues in many places overseas. Just these last five days: with India, Pakistan, Mozambique, Kenya, and Uganda. Where the hearts of forward thinking, hard working, sacrificial lives given over leave me in awe. Where we take turns following each others lead. Where phone calls are for the express purpose of praying for nations and praying for each other. Where emails are for the express purpose of preparing for further training, and of strategizing together. Where Facebook is for connections and visioning and simple heart care back and forth. It is a way of doing life where we draw strength from each other, and where we are making commitments to common visions and goals. I’ve hardly words really. All I know is, this work doesn’t feel like work to me, it feels like worship. This kingdom of God come to earth, this reign of God played out as we simply declare ourselves for each other. It is rich. Very rich indeed.